Erected to the loving memory of our beloved parents. Andrew Sutherland died at New Road Mid Clyth 18th July 1942 aged 78. 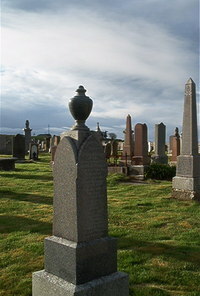 Wife Isabella Gordon died 19th March 1922 aged 53. Son David Sutherland died of wounds in France 8th May 1918 aged 23. Daughter Isabella Jane died 7th December 1903 in infancy.